This one-pan supper is delicious served simply with a fruit or vegetable salad alongside. Paprika and rosemary deliver a double hit of antioxidant power. 1. Preheat oven to 425° F. Mix oil, paprika, rosemary, sea salt, pepper and garlic powder in large bowl. Add chicken and potatoes; toss to coat well. Arrange potatoes in single layer on foil-lined 15x10x1-inch baking pan sprayed with no stick cooking spray. 2. Bake 15 minutes. Push potatoes to one side of pan. Place chicken on pan. 3. 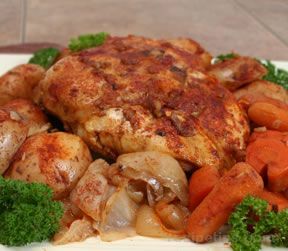 Bake 30 to 35 minutes longer or until chicken is cooked through and potatoes are tender, turning potatoes occasionally.